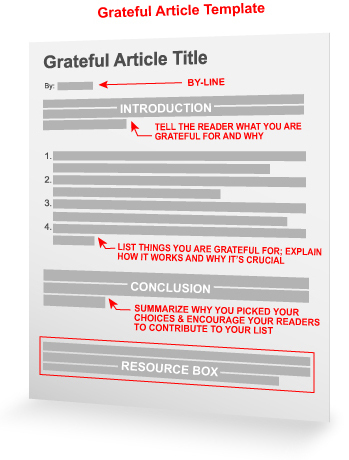 Give thanks for this extremely simple, yet useful and thought-provoking, article template. We could all be a little more grateful, couldn’t we? What better way to express our gratitude than to write an article about it? What are you grateful for in your niche? Are you grateful for new technology that makes your work easier? Are you grateful for a selection of books or other products that help you get the job done? Are you grateful for a variety of motivational or inspirational quotations or ideas that help you get going each day? This article template helps you identify what you’re grateful for, so that you can give your readers the same benefits you’ve received. If you’re helping your reader get out of debt, you can show them 5 or 10 debt-reducing tools for which you are grateful. If you are writing about something more enjoyable – like cooking – you can show your readers which gadgets you’re thankful to have in your kitchen. Introduction – In your introduction, tell your reader what you are grateful for and why. Create a list of things you are grateful for (be specific) and explain how each item works and why it’s so crucial. Conclude by summarizing why you picked your choices and encouraging your readers to contribute to your list. By using this amazingly simplistic template, you should be able to write tons of articles on the things you are grateful for. Once you start thinking about what you’re thankful for, it practically writes itself! Just remember that it doesn’t all have to be about “stuff” – Make these articles reflect a lot of the different ideas and thoughts you have about your niche. I’m truly grateful for the sunshine and happiness my niche provides. This template is perfect for my readers. I’m grateful for life – Wow! What a ride during all of these past 82+ years! I’m SO grateful for the new slant on what I was beginning to think a very mundane subject. I am grateful to have found this EzineArticles resource and the helpful and inspiring emails, like this one, that helped with that darn blank page that has been staring at me all morning. No sweat,…I’m grateful for many things. oh you’re all makin’ me puke! Nah, just kidding. You are all pretty good, you know! I am greatful to see the testmonies of people who have use their wealth of training and experience to serve humanity and to be able to share their success stories. wow great post. I tend to only read the blogs that I find interesting . Wow! what a different way of looking at things. I’ve never actually espoused what you have suggested. Thank You. Nice posts–yours and #5, too. :) (I’ll bet the others were also great.) Wouldn’t it be good if lots of people took up this attitude of gratitude and shared what they were grateful for? Too often, we forget how blessed and fortunate we are. Articles like this would help us remember. Nice template idea. Thanks! i am grateful for the smile in my colleagues’s face and the new chances everyday. This is a perfect article for me, the founder of ThankingOfYou.com, the Web-based “monumental movement” for posting stories of gratitude for those who have made a difference in the life of another! I’ll be using it; thanks, guys! Thought-provoking questions about the role of gratitude in our lives. Results due out in April, should be interesting! I’m grateful EzineArticles is still around and is not full of tripe which brings me to being grateful to have had my first article approved! Thanks!. Can see the use even for articles about spirituality. Never too much attention to a clear layout and an easy to understand message, even on the spiritual subjects…. Wow…I feel great by just read the template title. This simple template inspires me to write in a creative angles. Wow, this template are great, it is give me a light how to make a great template, thanks for sharing ! I am grateful fot this new slant on my writing fro my articles. Is the ether trying to tell me something? I guess by my liking this angle on writing more – yes!! I’m not able to see your account as it must be under a different email address. If you have any questions on your articles or why they were problematic I highly recommend using the Contact Us button within your My.EzineArticles account. Our Member Support Team is here to assist you with any questions you may have.